Pentek 10" Slim Line Water Filter Housing features a blue reinforced polypropylene cap and a clear Styrene-Acrylonitrile (SAN) sump. The sump is annealed (heat treated) to relieve stress, add clarity and increase strength. 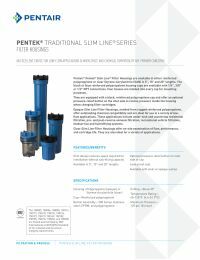 Pentek clear slim line housings offer on-site examination of flow, performance and cartridge life.